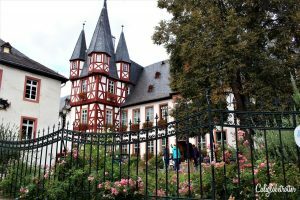 Along the picturesque, winding river of the Rhine, just an hour from Frankfurt, you’ll find the enjoyable historic town of Rüdesheim am Rhine surrounded by fields of vineyards, producing the region’s most famous wine, Riesling. 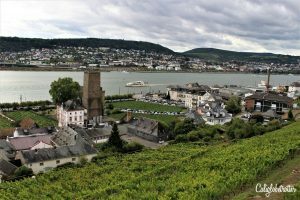 This region of German has produced wine here since the time of the Romans and Rüdesheim am Rhein is the gateway to the Upper Middle Rhein Valley UNESCO World Heritage Site. Come along with us as we explore the are via chair lifts with picturesque panoramic views and wine! Want to Visit This Darling Town? PIN IT FOR LATER!! This article is now available as a mobile app. Go toGPSMyCity to download the app for GPS-assisted travel directions to the attractions featured in this article! Rüdesheim am Rhine lies on the east bank of the Rhine River slightly before reaching the Loreley. Just a few kilometers past the town, the river was once so un-navigable because of rapids and sandbanks that the goods on the ships were unloaded in Rüdesheim before being taken to Lorch and put back on to ships there. Because of this reason, Rüdesheim became a wealthy town. 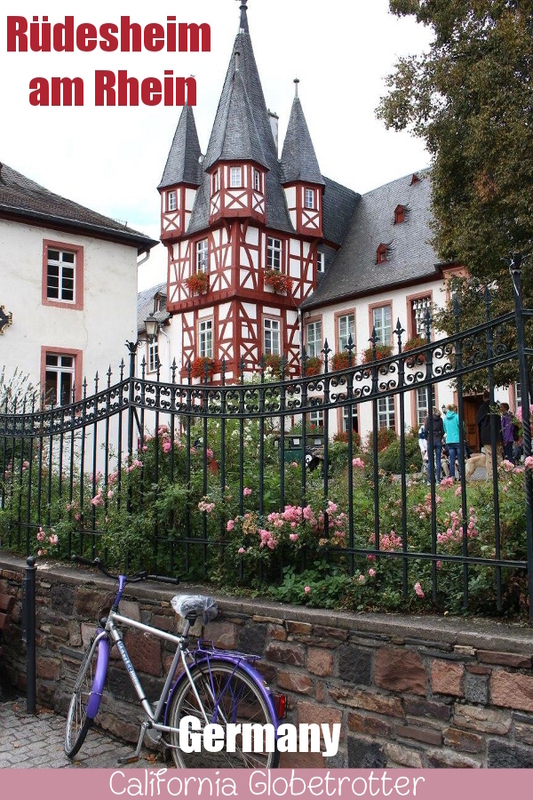 Today, it is a popular tourist destination in Germany for those cruising down the river by boat, people biking or driving along the Rhine all looking to experience a time long gone and is one of the most popular small towns in Germany! 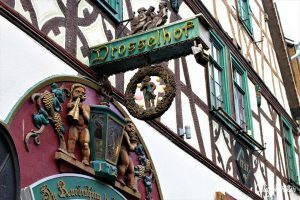 After all, it is one of the BEST Day Trips from Frankfurt! The Rhein region of Germany is by far one of the most popular places to visit in Germany for it’s rolling landscapes lined with vineyards known for their Rieslings and Pinot Noirs, cute little half-timbered towns dotting the region and a plethora of castles following the river every few miles. 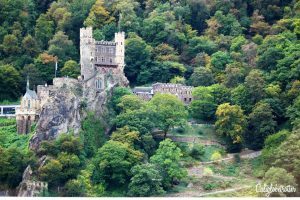 If you’re looking for castles in Germany, than this is the place to be and along with Bacharach and Cochem is an easy day trip from Frankfurt! What can you do in this tiny cobbled-stoned town you might ask? 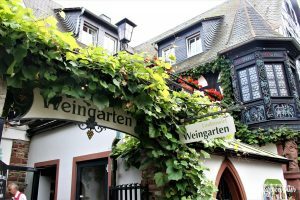 To begin, you can enjoy the region’s most famous wine, the Riesling at a Winegarten. This is certainly a garden I can wrap my head around! You’ll be hard pressed to find a biergarten in this town! Love sending your friends and family postcards while traveling? 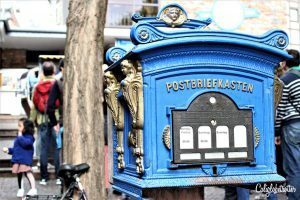 Why not send it from this adorable little mail box! 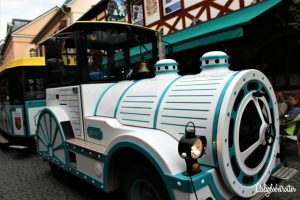 Take a ride through the town and surrounding vineyards aboard the Winzerexpress, which has been an attraction in the town since 1978! All aboard!!! 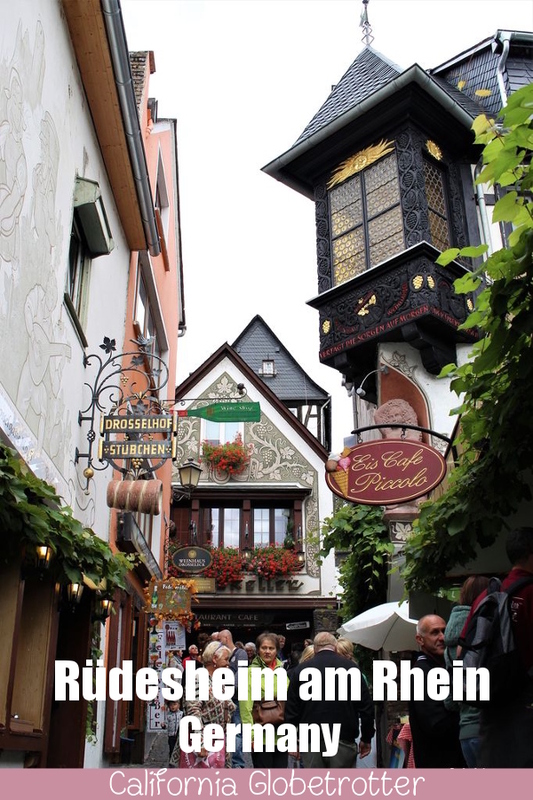 Stroll up and down the most picturesque alley in all of Germany: Drosselgasse which is lined with bars, restaurants and wine taverns selling freshly pressed wine! This is the most popular street in the town and for good reason: it’s incredibly picturesque. 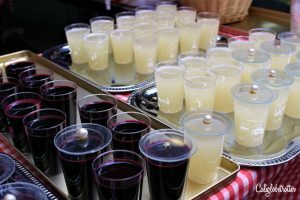 Stop and enjoy a glass of Federweißer which is fresh wine which has been freshly fermented and can be a bit sparkling. Because of rapid fermentation, Federweißer can not be stored for long and should be consumed within a few days of purchase. However, it typically comes out at the beginning of September and is only available for a few weeks and is one of the most delicious things to drink in Germany. Get it while it’s fresh! 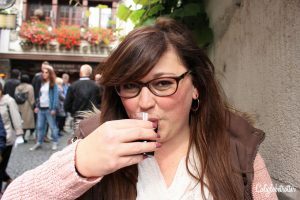 I look forward to drinking Federweißer every autumn and it’s one of the best reasons to visit Germany in Autumn! Enjoy one of the delicious looking Baumstreizels which is a doughy round piece of heaven, most commonly coated in cinnamon and sugar, but there is a flavor for everyone! These are typically found at Christmas markets as well as at many other festivals throughout Germany, the Czech Republic and more. Check out the old aristocratic residence of Brömser Hof which was built in 1542 which today houses the mechanical musical cabinet. I seriously couldn’t get over how incredibly picturesque this historic house was, which even had a vintage car sitting in front of it. I still can’t get over the Disney-esque turreted tower which looks straight out of a fairy tale book! Also take a gander at the Winzerhof next to the Brömser Hof. 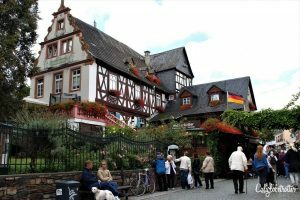 This is where the Rüdesheim Christmas Market is located which looks absolutely magical which I would looove to visit one day! Take a ride up the Seilbahn in a cable car fit for 2, soaring above lush vineyards. The journey takes between 5-10 minutes and each cable car is quaint and cozy enough for only two people. On this day, I had underestimated just how chilly it would be with cold air blowing at you. But the views over the surrounding valley were absolutely breathtaking! **TIP: don’t stand in the long line to buy tickets when there is a machine directly in front of the building! 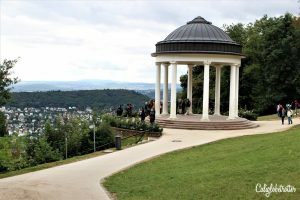 Learn some of Germany’s history by visiting the Niederwald Monument which is perched above the vineyards overlooking the town of Rüdesheim. 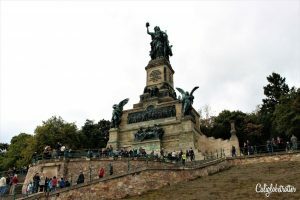 The monument, a statue of Germania, symbolizes the unification of the German Empire and commemorates foundation of the German Empire after the Franco-Prussian War in 1871. 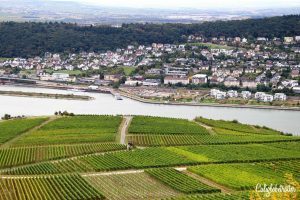 Enjoy the views from the top over the Rhine Valley which has been producing wine here for over 2,000 years. That’s a lot of wine when you think about it! We walked around the small park and monument in about 30 minutes before catching the next cable car back down into town. Once you’re done visiting Rüdesheim hop in your car and drive few kilometers to visit the statue of the Loreley am Rhine which holds many legends and admire the endless amounts of castles located in this region. 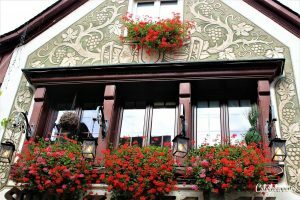 Where to stay near Rüdesheim am Rhein: As we would be visiting both Rüdesheim am Rhine and Bacharach, we opted to stay in the middle of both at the cute little B&B Altes Rathaus ⭐⭐⭐ in Aßmannshausen. The hotel is actually an old city hall building directly located along the Rhine River! 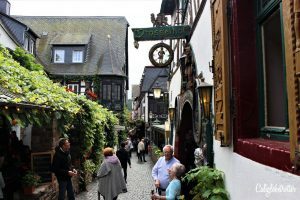 Overall, Rüdesheim am Rhein is one of the top places to visit in Germany and a visit will definitely leave you wanting to explore more of Germany’s half-timbered towns! 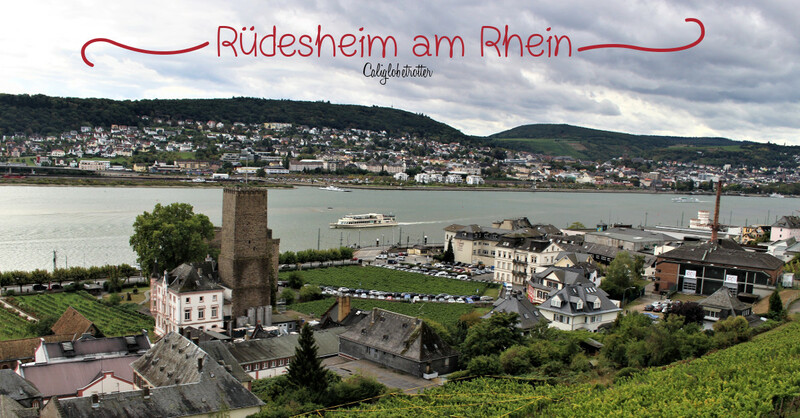 I always take new guests and visitors to Rüdesheim! It’s so close to Frankfurt that it’d be a shame if they missed out on this beautiful part of Germany. One of my favorite things to do there is hike up to the Niederwalddenkmal and then walk to nearby Assmannshausen. It was certainly lovely! 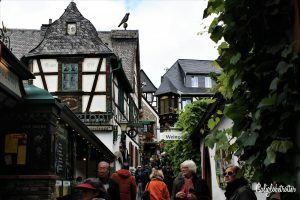 Although we also went to Bacharach (stay tuned) and we found that much more enjoyable and way less crowded! But next time we go to Rüdesheim I want to walk through the vineyards! Oh wow!!! How have I never been here?!?! Loved this post – it took me right back. We spent a week in this area quite a few years ago but I remember loving this place and that cable car ride was so much fun. Great memories. 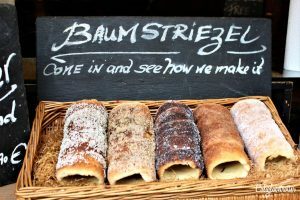 Ha,ha, did you know that the Baumstreizels are called Kürtőskalács in Romania (more precisely in Transylvania) and in Hungary? And they are the same identical thing. I bet you each of these countries brags it’s their own recipe. I’m sure because I’ve even seen it in Prague and here in Regensburg! I am going to have to stop reading your posts! I get so depressed at the number of places that we have missed! We have been farther down the river at Sankt Goar and Bacharach, but missed this one! Beautiful! And I love your food and wine/beer photos. Aww that’s a shame! Hope you can make it back to check it out! It is pretty adorable! Stay tuned for Bacharach! 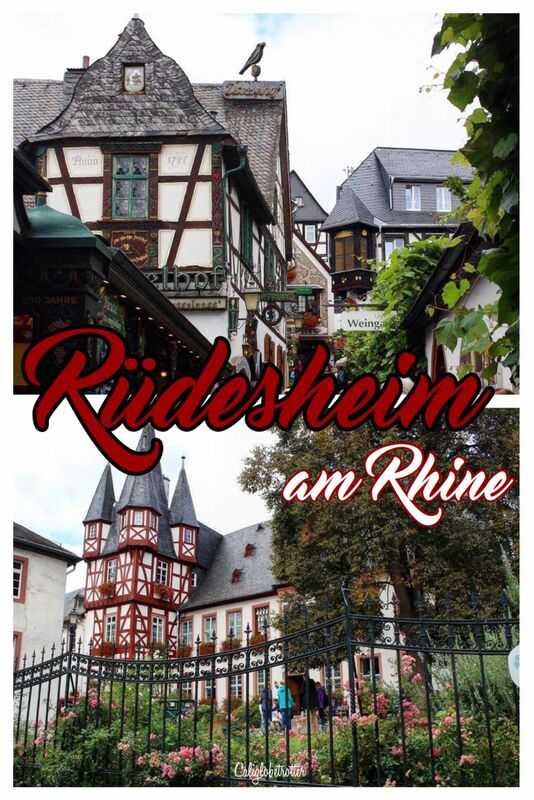 My mother loves receiving postcards, and one from this pretty little box in Rüdesheim am Rhine would make her happy. I bet it is! I’ve only seen pictures but would love to go! When I do eventually visit Germany, I am using your blog series on the picturesque towns as a guide for my travels! Love this pretty little town. It’s the best part of Germany! We love visiting the small towns! I’m going to do a post soon and combine them all into one post – stay tuned for that as well as Bacharach! Rudesheim is well worth a visit. We, too, used to take folks there when we lived closer. So cute! This is exactly what I think when I think of Germany, such a gorgeous town!! Ya they’re everywhere! You can get them at many Christmas markets in Germany too. Well rest assured you can get them here in Germany too, especially at Christmas markets! Awww you make me miss Germany…. again! 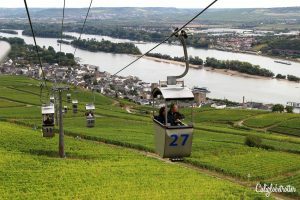 😀 I didn’t know they had a cable car in Rüdesheim though, all the more reason to go! How beautiful and just so wonderfully picturesque! 🙂 Thanks for showing us around! Every time I read one of your posts it makes me want to be back in Germany. 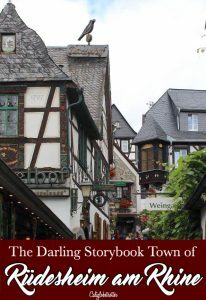 This an area of Germany that I didn’t visit when I studied abroad there, so I’d love to get back to explore it.